iPhones entering a growing "secondary market" from upgrading owners are allowing carriers to increase subscribership without paying subsidies as Apple gains new initiates to its iOS ecosystem. A study released on Tuesday by Consumer Intelligence Research Partners (CIRP) found that the secondary mobile phone market, or used handsets that find new life with a second owner, has blossomed since the launch of the iPhone 4S in October 2011 and could be a source of found income for both telecoms and Apple, reports All Things D.
The study reveals that old iPhones often see new life as an economical way of entrance into the Apple ecosystem and helps to explain some of the incongruities seen between the number of carrier activations and handset sales data. 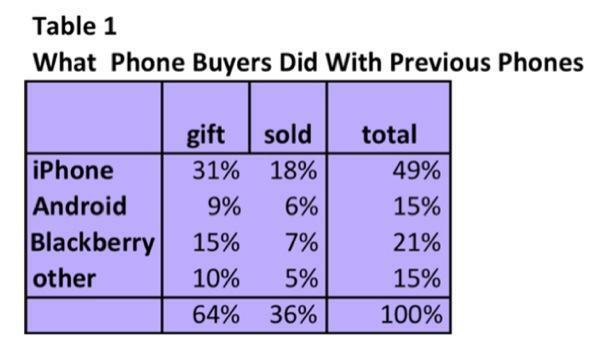 CIRP notes that 53 percent of new iPhone owners introduced their old handset to the secondary market, with a majority 49 percent being older iterations of Apple's popular mobile smartphone, followed by Blackberry with 21 percent and Android with 15 percent. Remaining handsets entering the secondary market were specified as "other" and constituted another 15 percent. Of the surveyed new phone buyers who gave their old iPhone to another person, 87 percent said they expected the recipient to actiate the smartphone on a wireless network. CIRP estimates that 11 percent of iPhone activations in the test period were previously-used handsets, meaning that carriers gained new iPhone subscribers without having to pay subsidies to Apple. The firm guesses that AT&T and Verizon saved between $400 million and $800 million in subsidy costs, or about $400 every secondary market iPhone activated. Analysts estimate that iPhone sales for the first fiscal quarter range from 25 million to 36 million units. While the economic boosts from the burgeoning secondary market are somewhat quantifiable for mobile carriers, Apple's gains are more subjective. New secondary market iPhone users are also potentially new iTunes users who will make music, video and app purchases, and may be candidates to buy existing or future Apple devices once integrated into the company's ecosystem.